I received a Facebook message with this photo from my junkin' friend, Jodi. It said that she had dropped a little stool on her garage floor and broke it. She said she would give me the stool, and I could figure out something to do with it. Of course I didn't turn it down. So with a diagonal split on the table top and two legs off, I came up with a fix. Here is the fix. 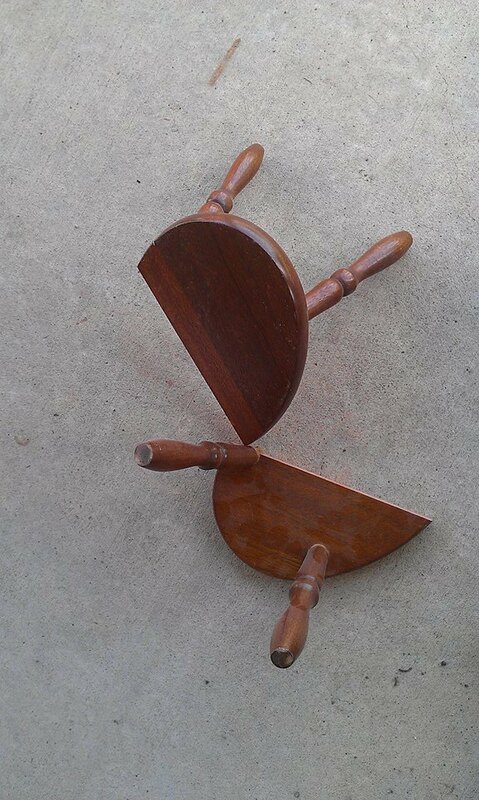 The legs were re-attached with screws right through the table top, and the mending braces re-connected the table top. I purposely left a small gap in the table top, and put the mending braces on the top so it would look like an amateurish fix. Next I painted the table with Annie Sloan Chalk Paint in Old White. Of course the stool was distressed with sandpaper, and waxed. My little mended stool makes a great little plant stand! Made with a free stool, one 67 cent and two 57 cent mending braces, and a little paint and wax. You are genius my friend. This is too awesome. The re love of this little stool is so great. So much prettier now. Carlene...it looks like it was made that way. It's so pretty painted white...love it!! Now that is amazing! So much cuter with the clamps showing. Just another reason to mend something! And it has so much character now-- where a perfectly pretty stool, would just be blah! Now I want to run around the house and saw things in half Carlene - this looks amazing ( I like it so much better broken and haphazardly fixed ) It's gorgeous ! Looks great......and like it's been around a long time! Now hang on a minute... that ISN'T the right way to mend things? Its my style of mending. Love it!